Mensusa https://www.mensusa.com/articles/mens-royal-blue-blazer-mature-sense-of-dressing.html Mens Royal Blue Blazer- Apparel That Reflects Your Mature Sense Of Dressing The mens royal blue blazer is a relevant choice of apparel for wide arrays of dressing needs. These apparels enable you to make a classy and high-fashioned appearance to the public. Royal blue is a shade that appears extremely attractive and it features a classy & elegant look. In the domain of men's fashion, royal blue is among those shades that men most commonly opt for the color of their apparels. The mens royal blue blazer is truly a classy choice of apparel that will get you a polished and high-fashioned appearance. As the royal blue shade has always been the top choice of the shades of apparels for centuries, in contemporary times, the mens royal blue blazer had turned to be an icon. The blazers feature the same elegance and gravity as the suit coats, however, comes much more comfortable. The modern royal blue blazer features a sleek and sharp appearance that can attract the attention of the crowd very easily. The blending of the stylish and classy look makes these apparels delightful as a choice of apparel. The royal blue blazer balances between the gravity of the suit coats and, add with it the sharp flairs of contemporary fashion. Hence, you will obviously appear as an individual with strong fashion pursuits and a mature sense of dressing. Irrespective of the specific spirit of any event, the common point is that you require a decent and polished look to appear in the event. Hence, the royal blue blazer will be the most relevant apparel option to embrace. You can wear these apparels at the formal as well as the business ambiances and events. 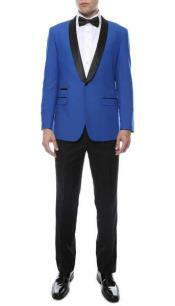 Likewise, the royal blue blazer is a candid choice for the promenade occasions and special events. The blazers in royal blue shade will be equally relevant to serve your dressing needs for the daytime as well as at the evening occasions. Hence, it will be wise to say that these apparels serve your dressing needs on the most comprehensive ways. The market has availability of the royal blue blazers in different design and style. You can expect to get widespread variety even on the parameter of the fabric, used in its fabrication. The availability of the lighter weight, as well as the heavyweight fabrications, will enable you to wear these stylish apparels the year round. Royal blue stands as a wonderful contrast to various shades and hence, you will get lots of options for the shirts, trousers and the fashion adornments, that can be perfectly paired with these blazers. www.mensusa.com supports the fashion pursuits of men by getting them the most fashionable apparels and fashion adornments for the most competitive price. The shop holds a reputation for offering the most delightful customer services to the buyers, at the pre-sales and post-sales phases.